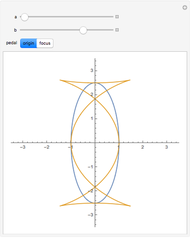 The pedal curve of a curve with respect to a point is the curve whose points are the closest to on the tangents of . This Demonstration concerns the inverse of a pedal curve, sometimes called the negative pedal curve. The negative pedal of a curve can be defined as a curve such that the pedal of is . This Demonstration allows you to explore two sets of the negative pedal curves of an ellipse. 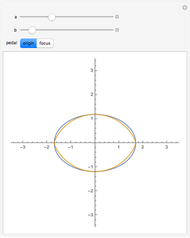 An ellipse can be described parametrically by two equations, each of which contains a constant; in this Demonstration these constants have been labeled and : , . The same two constants appear in the parametric equations of the negative pedal curves. 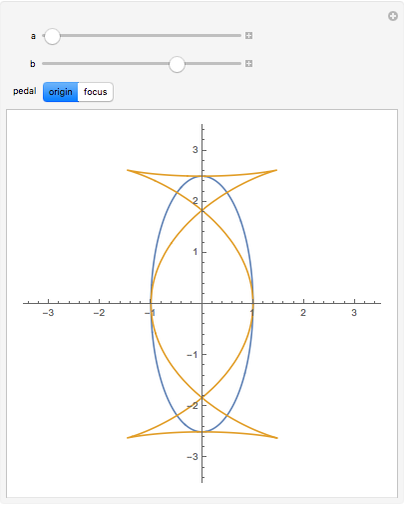 The set of negative pedal curves with respect to the origin includes a curve known as "Talbot's curve" which has four cusps and two ordinary double points. 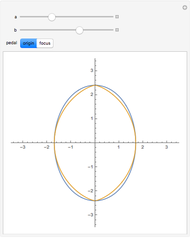 The set of curves with respect to one of the foci is called "Burleigh's ovals" and includes a fish-like curve that inspired a paper by H. Martyn Cundy (Mathematical Gazette, 85(504), pp. 439-445). Michael Croucher "Negative Pedal Curves of an Ellipse"